The Fuller Building in E 57th Street, built 1928-29, was designed by architects Walker & Gillette. The Fuller Construction Company had a previous building in New York City. The earlier one was designed by Daniel Burnham and built in 1902. It was meant to carry the name Fuller Building but because of its unusual shape it was called the Flatiron Building and remains so today, a major NYC landmark. 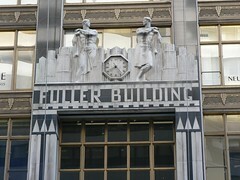 With the 1928-29 building, the Fuller Construction Company built the name into the decoration above the entrance and it has outlived the company and is still known as The Fuller Building today. Above the name, two figures seem to rest contentedly on the city they have just completed and the decoration in the foyer also includes various tools of the building trade. Very fitting for a construction company.